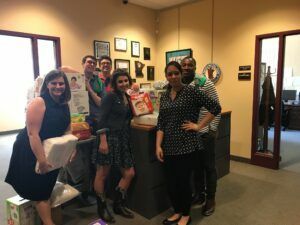 Congressman Keith Ellison’s D.C. and district offices volunteered their time last week to sort and deliver diapers to five Diaper Bank of Minnesota partners. As a result of the effort, 5,210 diapers and 10,854 wet wipes were distributed. 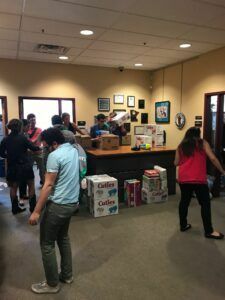 Many of the diapers distributed were dropped off just one week prior by Lasting Impressions Child Care Learning Center, underscoring the need the Twin Cities metro-area has for diapers and wipes. Congressman Ellison has been a strong supporter of policy change that would help families in need obtain diapers. He introduced the Hygiene Assistance for Families of Infants and Toddlers Act of 2017. The purpose of the bill is to amend the Public Health Service Act to address the increased burden that maintaining the health and hygiene of infants and toddlers places on families in need, the resultant adverse health effects on children and families, and the limited child care options available for infants and toddlers who lack sufficient diapers. Volunteers such as those from Congressman Ellison’s office provide an incredibly important service for The Diaper Bank of Minnesota. One of the unique aspects of our program is that it accepts opened packages of diapers. This is a great benefit for donation as many children outgrow diapers mid-package. This also means we need individuals willing to count, sort and occasionally deliver diapers. If you know a organization that is interested donating its time, please reach out to info@diaperbankmn.org. Volunteers from Congressman Ellison’s office preparing the deliveries. Volunteers from Congressman Ellison’s office and board member M.E. Kirwan with one delivery ready to go.